This nine-day expedition will explore three tropical ecosystems in Belize — the deciduous, dry tropical forest in the West, the rainforest in the Central/South, and the barrier reef off the eastern coast. In each habitat, your daily guided activities begin with a morning bird walk (you may see parrots flying overhead or kiskadees calling from a branch) and end with a night nature walk (highlighting astounding insect biodiversity and nocturnal animals of all kinds). Between those daily bookends, adventure beckons! You will delve into dark caves, play in remote waterfalls, explore ancient Mayan ruins, and canoe on a tranquil Central American river. At each step, we will discuss tropical biology and ecology, cultural history, and how human impact shapes all aspects of Central American life. Your immersive tropical experience will culminate with a stay on a breathtaking private island in the series of offshore barrier cayes. There, you will snorkel and swim along the coral reef and float through the mangroves to observe marine biodiversity both during the day and at night. 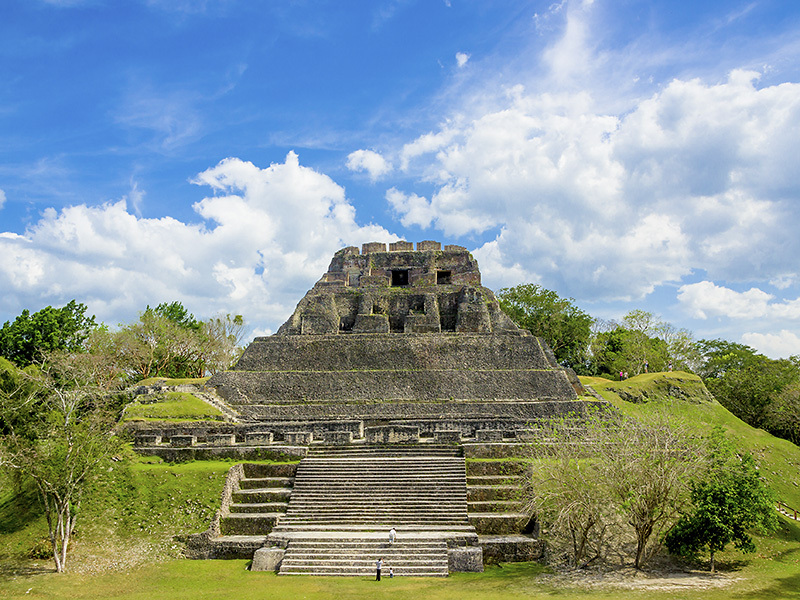 Although a small country, Belize boasts several distinct ethnic populations, including the Creole, the Mestizos, the Garifuna, and the Maya. Your travels will feature experiential interactions with each, providing learning opportunities about their rich histories and cultures. We hope that you will come to this adventure with an open mind and a willingness to leave your everyday world behind so that you can immerse yourself in the rich and magical experience of Belize. Moderately strenuous – this trip involves hiking, canoeing and swimming in relatively high temperatures and humidity. Because of these extensive outdoor activities, we suggest that participants should be in reasonably good health and not subject to major mobility challenges. All ages are welcome (but very young children may also be challenged by these activities). In the West, we will stay at duPlooy’s Jungle Lodge, nestled along the banks of the Macal River on 100 acres of lush tropical broad-leaf forest, and with the Belize Botanic Gardens onsite. In the Central/South, we will stay at the Bocawina Rainforest Resort, a spacious jungle eco-resort that runs on alternative energy, located within the Mayflower Bocawina National Park of more than 7,100 acres of lush jungle, refreshing waterfalls, and ancient Mayan sites. On South Water Caye, we will stay at Pelican’s Pouch, a serene island paradise that will be our private home base for our Caribbean explorations. Jason studies insect evolution and has conducted fieldwork in Belize to discover and document tropical insect biodiversity. Liz Baird has been leading Educators of Excellence Tropical Ecology Institute trips to Belize since 1995. One of the first licensed guides in Belize, Nathan’s depth of knowledge of the diversity of animal and plant life is unparalleled. This Connect-With-Nature Adventure is open to Members only. To become a Member, please contact Catherine Perkins, Membership Coordinator, Friends of the Museum, catherine.perkins@naturalsciences.org or 919.707.9296. The total per-person cost is $4,250 for double room occupancy, or $5,250 for single occupancy. This includes international airfare from Raleigh to Belize, domestic airfare for any flights within Belize, all accommodations and meals, bus and boat transportation, guide fees, park admissions, guided tour fees, and a pre-excursion orientation meeting. Costs for alcoholic beverages, souvenirs, and gratuities are extra. Personal travel/health insurance is highly recommended. A passport valid for at least three months after the dates of this trip is required for travel. Spaces will be filled on a first-come, first-served basis until the maximum number of 14 participants is reached. A non-refundable deposit of $1,000 per person is required upon reservation to hold a spot on this trip. Registration will end December 22, 2018, and full payment is due no later than January 15, 2019. Reservations will be acknowledged in their order of receipt until the maximum is reached, after which a wait list will be used in the event of any cancellations. We reserve the right to cancel any trip because of inadequate enrollment that makes the trip economically unfeasible to operate. In this event, we will refund your deposit. However, we are unable to refund any deposits following trip cancellation that results from factors outside our control, including but not limited to terrorism, natural disaster, or other major global events, and therefore recommend you purchase travel insurance. We are not responsible for costs incurred by a participant in preparing for a program that is altered or canceled. For any questions about this Adventure, please contact Barbara Osbeck at barbara.osbeck@naturalsciences.org or 919.707.9855.